26 year old service business performs parking lot sweeping, striping, and power washing. 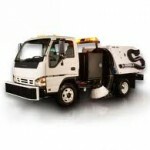 Other services include road striping (thermoplastic), concrete cleaning, and road signage. Most contracts are long term. A majority of the sweepings accounts are for “big box” stores and are performed 7 nights per week using specialized commercial sweeping trucks. Striping is normally performed in parking lots, intersections, and roadways. Customers include large corporations, general contractors, TXDOT, cities and other governmental agencies. Many are bid situations and are for long durations. Large amounts of repeat business. Business is relocatable in the DFW area and involves having a secure parking area for the vehicles. An office for an accounting/scheduling person and an estimating/bidding/sales person. Current owner has several other growing businesses and wishes to spin off this business. Revenue is $1M + and was over $4 million + per year when the owner was spending full time on this business. A burnt out corporate person might be ideal for this opportunity or someone in a related business looking for an add-on business.